11 bit studio’s survival management sim Frostpunk is getting a free expansion titled ‘The Fall of Winterhome’. It’s a new story mode that’ll let you experience the tragic events that led to the demise of Winterhome. 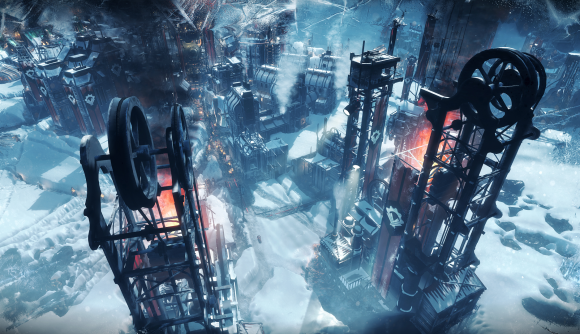 The Fall of Winterhome is out next week, on September 19, and will feature a brand new map and “a fresh take on Frostpunk’s mechanics.” The challenge in Frostpunk isn’t in its management decisions but its moral ones, as you must manage an industrial city while also ensuring the survival of mankind during one of its hardest times, which leads to some pretty bleak decision making. Better prepare for more of that in this new ‘fresh take’. The announcement picture shows a generator – a key component in the game and the heart of your city – engulfed in flames, surrounded by wreckage. You didn’t honestly think 11 bit would release a happy expansion, did you? If you’ve played Frostpunk before, the name Winterhome should set off alarm bells. In the main campaign, it was a town that had a reputation for being a beacon of hope and a symbol of human civilisation’s perseverance – before it was destroyed, that is. It was a mystery as to why Winterhome fell, but with this new story, you can finally find out what happened. This new scenario will join the game’s other two story-driven scenarios: The Arks, which has you help scientists trying to keep rare plants alive; and The Refugees, which has your city subject to waves of refugees as you try to desperately house and feed them all. 11 bit’s previous game, This War of Mine, was also updated with free content, as well as paid DLC that saw proceeds donated to charities, including War Child. Frostpunk has had the same treatment with multiple free releases, new Survivor and Endurance game modes, and several new scenarios – which now includes ‘The Fall of Winterhome’. 11 bit really knows how to support its community.